Our paper procurement policy includes preference for Forest Stewardship Council® (FSC®) certified paper suppliers who maintain standards for the protection of ancient and endangered forests. Where feasible, recycled paper stocks and environmentally friendly vegetable based inks are utilized. The Watermark Group recycles over 300,000 lb of paper each year. Committed to investment in workflow automation, our analysis of operational data is used in developing optimization methods and waste management goals across the entire company. Our commitment to sustainable solutions planted the seed for TWG360solutions. Working closely with our client partners we combine sourcing and digital printing technologies with client-based demand planning. This results in effectively reducing our client’s quantity of obsolete and wasteful inventory, which means less waste sent to landfills. 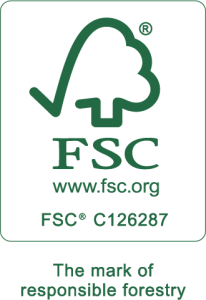 The Watermark Group has received certification as an FSC Chain of Custody provider, offering south Texas companies the ability to label their printed materials with the FSC logo. The Chain-of-Custody process ensures the consumer that the FSC-certified products they purchase are coming from responsibly managed sources. For a consumer to purchase an FSC-certified product, every company that previously had ownership of the forest product material components of the end product would have had to be FSC certified.